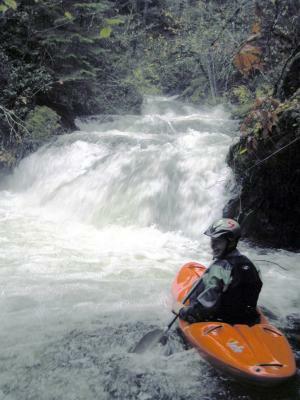 Copyright 2006, Oregon Kayaking, James Bagley Jr. and EJ Etherington. 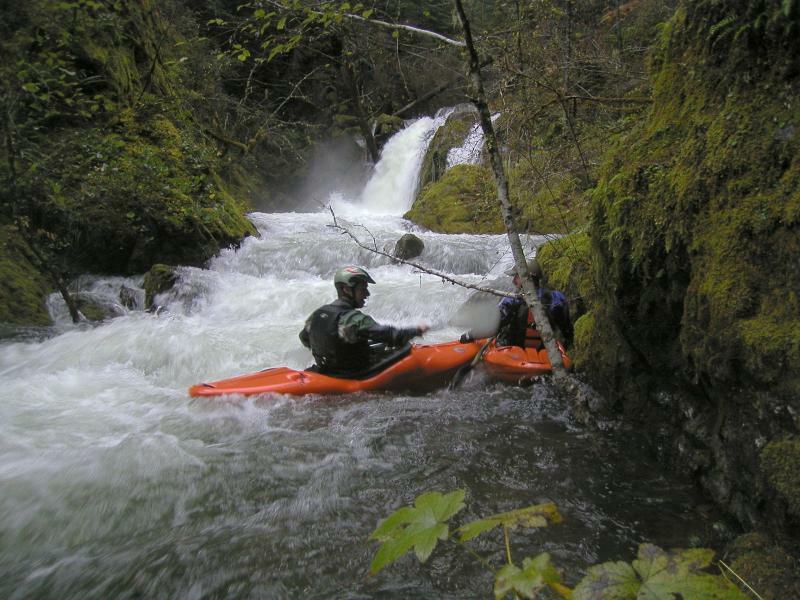 No part of this page may be reproduced, linked, or copied without the express written permission of the Oregon Kayaking webmaster, James Bagley Jr. and EJ Etherington. 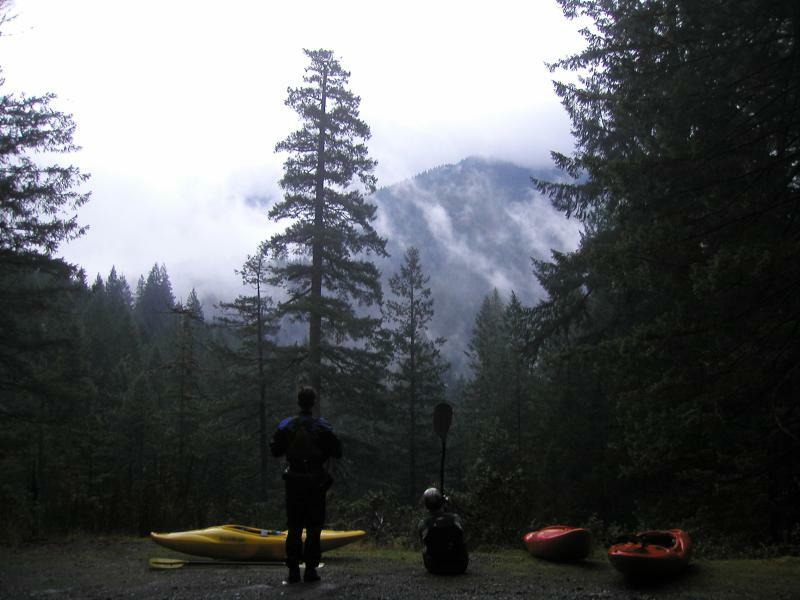 Every fall, Oregon kayakers eagerly anticipate the winter rain storms and spend their weekends paddling the same couple of rivers that still have water in them. When a good rain finally comes we dust off our creekboats and go look for some burly class V. Re-learning to creek this way, instead of slowly ramping up, is less like a graduate course and more like a Pass/Fail exam which I always thought was easier. This fall of 2005 a small group of paddlers from Corvallis decided to take our creeking re-certification exam on Henline Creek. It has big slides, waterfalls, sketchy wood, hiking and to top it all off the most difficult drop is ten feet below the put in. Perfect! Very few creeks in Oregon offer as much excitement in as short a run. If you stop at every opportunity (all five of them), shoot video and take photos your run will take less than two hours. We estimate that if you knew the run it would take less than ten minutes. Really a perfect way to get back into the feel of creekboating in Oregon. Highly recommended. James Bagley Jr. having a great time on Henline..
James and Chris enjoying the view at the end of the day..
Drive up the little North Santiam until you cross the bridge over Henline Creek (shortly after the road turns to dirt). The bridge is where you park to get to the put in. It's also a good place to leave your car to get to from the take-out. Hike upstream on creek-right (calling it a river just doesn't seem right) until it looks utterly unrunnable, which should be less than a quarter mile, hike back down a bit then put-on. Your take-out is below the bridge above the log choked mess and unrunnable sixty-foot waterfall. Should be less than a quarter mile. Recommend scouting the entire run before putting on. Henline Creek needs a couple days of hard rain to bring it in. We have done it as low as 2,500 cfs on the Little North Santiam gauge and as high as nearly 5,000 cfs. There are only minor differences between these flows, but I wouldn't want it any lower than 2,500 cfs. 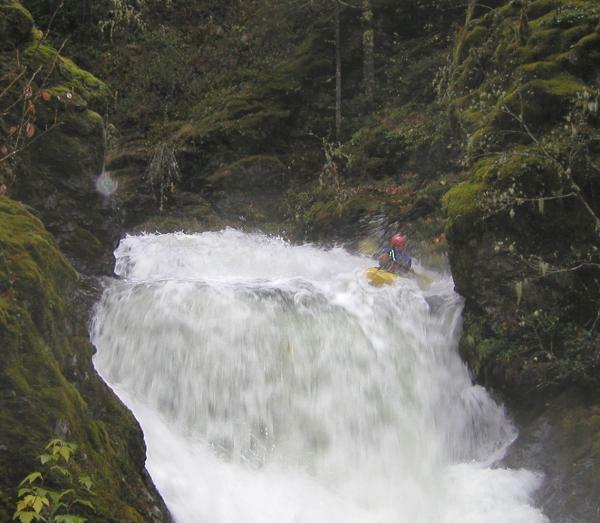 This creek can be done in conjunction with the classic Opal Creek section, as Henline actually empties into Opal Gorge, just downstream of Thor's Playroom.